LAKE MACBRIDE— Our pear tree is very tall. So tall the highest fruit can’t be reached without a ladder and a picker. Even then, some will be left on the tree. That’s okay because the shelf life or pears is very short, and we have all the pear butter we can use already in the pantry from last year. 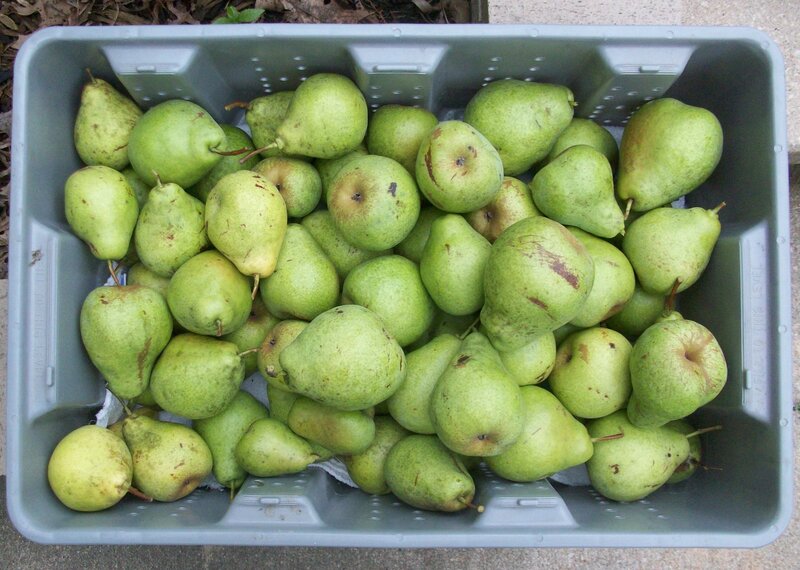 We’ll bask in the glory of fresh, organically grown pears for a week or so, and give a lot away during that time. The money spent to purchase this tree was paid back years ago. Just this year, I paid attention to how to harvest them, and found this information from Stark Brothers to be useful. If left on the tree, pears ripen from the inside out and taste mealy. Don’t want that. This one tree has been the perfect producer for us. Not too many pears, and not too few. It turns out I’m okay with eating pears for a few short weeks when they come in, and have little craving for them the rest of the year. One more way to sustain ourselves throughout the year with local food without eating the same thing over and over. This entry was posted in Garden, Local Food. Bookmark the permalink.